Thursday evening is traditionally ‘long run’ night at my running club. In actual fact it’s not really a long run at all, but rather meant to be a consistent running session, as variation from the speed or hill sessions that take place on a Tuesday evening. The group is training for a half marathon at present, and so on the plan for this week was a 5 mile run to be run at half marathon pace. Just like last time though, I did not end up running at my half marathon pace for the session! My legs were aware that I’ve started to pick the miles back up again and after a couple of miles began to protest that we were going quicker than I had led them to believe(!) It was incredibly hot and muggy out on Thursday night and this didn’t help things. I’d drunk waaaaay too much water before heading out as well, so by the halfway point I was bursting for the loo and leapt into the local pub for a stop off whilst everyone else carried on ahead. I could run much faster after that stop off! Even with my loo stop (where I didn’t pause my Garmin) I averaged 10:01 minute miles, and there were a couple of nasty hills at the halfway point on the route as well. As I arrived ready for the briefing a woman holding a young child started chatting to me. She asked if it was my first time at Sheringham, to which I replied that it wasn’t. She told me that she was on holiday from London and was planning on running with a buggy whilst her husband aimed for a PB. Sheringham is a great course, but not for achieving a PB or, I would imagine, running with a buggy! I wished them luck! At the briefing we were told that the parkrun would be run on the alternate course route as there were cows out in the field. I don’t think I’ve run the alternate course before although it was just the start of the course which was different. I started probably too far back in the line up at the beginning and spent a little while weaving in and out of other runners before finding my place on the run. I hoped that there weren’t going to be more hills on the alternate route as the course is already pretty tough, but luckily it was mainly downhill for the first mile or so and I capitalised on this, overtaking quite a few runners and sticking to my planned heart rate. I had gone into the run hoping for a course PB as my running is strong at the moment. My current course PB is 29:40, and I knew I had a good chance of beating that. I ran the first mile in 8:34, with the second in 8:46. I thought that even if I had a rubbish last mile now (the one containing Heartbreak Hill!) I should be on for a course PB, although I suddenly realised I wouldn’t be entirely happy with it, as it wouldn’t have been achieved on the same course! Mile three hit and as much as the first mile of the course is downhill (albeit across tricky terrain at times – roots, sand, mud…) the final half of the course is uphill and makes you work for it! Heartbreak Hill is very aptly named. Who puts a hill as steep as Heartbreak with less than quarter of a mile left to the finish line?! Mean. Really mean! I’ve had a hunt round on the internet for a picture, but am yet to find one that really shows the horror of that hill. Perhaps Sheringham parkrun race organisers don’t want to put off parkrun tourists?! This is the best I found (stolen from the Sheringham parkrun Facebook page). 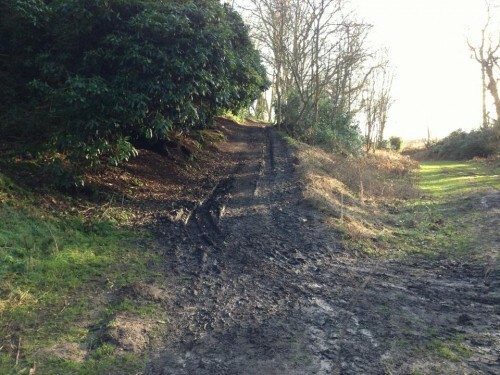 This was clearly taken in the Winter though – there wasn’t quite so much mud about this weekend! It also doesn’t really show you just how steep the hill is. It heads up as far as you can see in the photo and then continues bending round to the left out of sight. I must take a photo next time I am back in Norfolk. I have power walked this hill a few times in the past but determinedly ran it on Saturday. I really used my legs to power me up and overtook several runners who chose to walk here. Mile three went by in 9:35 but then the nubbin ending up measuring 0.33 miles by my watch, which I covered at 9:16mm pace. Looking on Strava afterwards, quite a few people seemed to measure the course long, around 3.3 miles. Great sprint finish at the end between me and two other ladies, with some friendly banter on the way to the finish line and once over the line I went and leaned up against a tree for a few minutes. The sweat poured off me when I sat down. I’m always alright until I stop and then I become a big sweaty mess! It was really hot and muggy out on Saturday morning (later getting up to 30 degrees) and I had wished I had worn a tank top by the end of the first mile. A few minutes later another lady came and sat up against the other side of the same tree where I was sat, exclaiming how tough that course had been towards the end! She had come with her husband from the Mansfield parkrun where she usually ran four minutes faster over the 5k distance. Her husband had actually planned on getting up at 6:30am for a run over from where they were staying in Wells (17 miles away) before completing the parkrun, but exclaimed now how he was glad that he hadn’t! After seeing a few more people cross the line I got up to get my token scanned. Apparently there had been a few problems with the scanning so I was to remember my finishing position in order to check the results later that day. There didn’t appear to be a problem though and I got my text an hour later as normal announcing my finishing time. Do you often chat to people you don’t know at parkrun? Does your parkrun have an alternative route? Are there many National Trust areas near where you live? Great job on parkrun- that looks like a killer hill. I got to parkrun for the first time since Jan 1st this weekend, it was extremely hot wasn’t it! I found it really hard going, having done little to no running for the past 6 weeks! Well done for getting back out there. You certainly picked a warm day to return! Oh jeeze what a hill for the end! Nice work though – not far off your course PB at all! Especially considering you started further back and had to weave a lot. Our parkrun has several different courses. The standard one is our three laps but sometimes they’ll be an event on and we get to do the cricket pitch (absolute PB territory) but this makes it tough because it means most people’s PBs are done on the cricket pitch so can never achieve it again on the normal course…We also have a winter course which is HORRIFIC. It goes down near the sea and can be so windy and then there’s another hill to contend with (again three laps). But it does make you stronger for when summer comes along again. Yeah, it’s kinda appealing in that you wouldn’t be able to give up on the way round if your final 5k was at parkrun! How interesting that your parkrun has so many different courses. Northampton is just always the same. I feel that each parkrun should display which course they used in the results though so that you can compare between your results properly! I went to Northampton Park Run this weekend, my goodness it was HOT but I was reminded of the fact it is lovely and flat & I can see the finish line soon on course which really helps! I need to become more of a Park Run Tourist, I may nip across to Milton Keynes Parkrun sometime…only because it’s very flat (see a pattern here?) and a change of scene is always good. I saw that you got a PB. Big well done you! Although you picked the one week I wasn’t at Northampton. 😛 Milton Keynes is probably a bit far for me but I want to try Bedford and Huntingdon at some point soon. Nice work! I love chatting to people at parkrun, I always find I end up chatting in the chip scanning queue. My current one has a killer hill, its the last .1 mile, but it is super steep, no sprint finishes here! St Albans has a winter course for when the lake floods, or if the path is icy. It’s 3 laps but whereas the normal one is flat around the lake, this one is up and down around a football field so much tougher. Yes, the chip scanning queue is a great place to start conversation. Lots of people are proudly chatting about their times there. It seems so many parkruns have an alternate route. I hope they let you know in advance which course they plan on using, otherwise it would be gutting if you had planned to run all out for a PB, only for the organisers to decide at the last minute that they were going to use the football field course!